Let me summerize the entire post by saying; Wow! It worked! And the longer version has me telling you that I was doubtful. You see, I've been coloring my hair for years. Ever since I was a 12 year old girl who, like almost every other 12 year old girl in the 80's, went through the "Sun In" spray in hair lightener stage and walked around with orange hair for a summer, I've been coloring my hair. I've always had fun with color and I've been every shade of blonde from platinum white to golden, every shade of red from strawberry to black cherry and yes, even every shade of brown and a couple times, gothic black. However I also inherited 'premature gray' genes from my Grandma H. I had my first white hair when I was 14 years old. Genetics aren't always good! LOL. Now that I'm in my mid-30's I'm finding more white hairs and the color is so difficult to get to stay! White and gray hairs are a different texture - not as porous and hard to color. 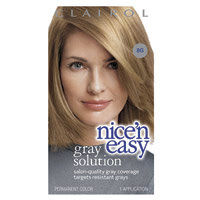 I just never really thought of myself as old enough or having a need for the 'gray' solution haircolor. Thanks to a marketing company (Samara! I adore you and your products!) that sent me the product to try this weekend I can tell you the application of the pre-treatment must do something to the hair (as they claim) because the color went into the white hairs and they are now a beautiful neutral blonde just like the rest of my head! The texture is soft. The color is true and uniform. I can honestly say this product worked for me. My only wish is that they gave you 'more' of the pre-treatment. They say to put it on from root to tip but when you have thick hair as I do (not to mention long) the solution (about a tablespoon if even that much) only was enough to do about 65% of my roots. It never made it much farther. Thumbs up for Gray Solution. I'm sold.